I started filming my hunts in the beginning of High School. I only filmed my hunts for proof to my friends, showing my stories weren't fibs. I started filming my family and friends and became addicted to filming all of my hunts. Friends and family really added character to the hunts and I have made and will continue to make memories that will last a lifetime. Whitetails have been my primary target since I started hunting and watching a deer grow from an early age to full maturity is something words can't describe. Watching the bucks year after year and really figuring out their patterns and routines is just as rewarding as it is shooting the buck. Can't thank God, my family, and wife enough for supporting me through the years. As for the Team Radical guys, I'm truly thankful for the friendships made over the years. I consider them family! I have now started traveling out of state in search of new experiences and critters. My goal is simple. I want to see and experience everything I can possibly afford. Lord willing, I will continue to travel across the U.S. and throughout the world after the species still on my list. Hunting has been an addiction of mine ever since my mom and dad introduced me when I was young. Ever since my fathers passing, I carry on the passion of hunting that we once shared. No matter if I am in front of or behind the camera I still get that adrenaline rush as if it was the first time! My experience with Team Radical has led me to new friends and places that most people will never get the chance to see and I feel blessed every day. I’m a graduate of SIU Carbondale with a Bachelors in Forestry. Since I have such a passion for the outdoors, it only made sense to me to incorporate it into my work. I currently work for the state as a CREP (Conservation Reserve Enhancement Program) Resource Specialist. I also feel it is crucial to introduce kids, as well as new comers into the outdoors, just as my father introduced me to keep this great tradition alive. I caught the hunting bug at age 5 and have been hunting with family and friends since then. I now work for a mapping(GIS) company and obsess over mature whitetails. Filming and capturing wildlife throughout the year is what I love to do with my free time. After my first harvest at age 10, I knew I was hooked for life. I continued my passion for the outdoors by attending SIU Carbondale and graduating with a bachelors degree in Forest Resource Management. Steve Niemerg and I partnered up and started our own businesses together which are "Roepke & Niemerg Tree & Conservation Service" and "www.WildlifeManagementTrees.com". Hunting and implementing habitat improvements on hunting properties throughout the state are everyday events for us. Hunting used to be a hobby, now it is a career. Throughout the years, I have been able to witness whitetails reach their full potential and capture it all. Although I don't put a tag on a mature buck every year, I always have a wild ride and story worth documenting. Being able to watch and pattern deer is a true accomplishment in my opinion, and I love to film the hunts as much as actually shooting the mature bucks. I promise you will see my face on the blooper reels much more often than you see me sitting behind a giant trophy. However, I have excepted that viewers are laughing at me; not with me. Outdoor Enthusiast doesn't even begin to justify Steve Niemerg's love for the outdoors. Steve has been whitetail hunting for years, but also enjoys other hunting game that includes turkeys, gators, boars, and bears. Not only does he spend countless hours in the woods for recreation, but after exiting the United States Army he has also focused on improving habitat for wildlife through his tree planting businesses of Roepke and Niemerg Tree and Conservation Service www.WildlifeManagementTrees.com. I have been hunting pheasants, rabbits, and squirrels since I was old enough to carry a gun. As I grew older, I gained an interest in deer hunting through a couple of friends, and the fire was ignited. 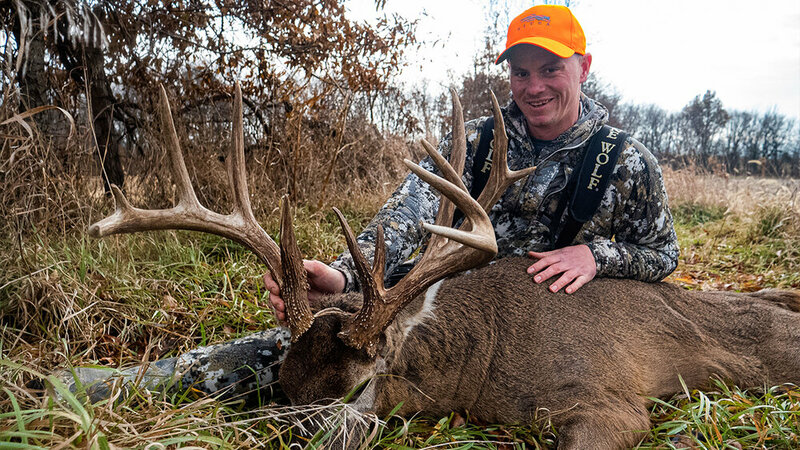 It started with gun hunting, transitioned to bow hunting, and is now an ongoing obsession, year-round. I specialize in hunting very small tracts for giant bucks. I have gained experience with this type of hunting through trial and error over the years, due to the general lack of large tracts in my area. In the past 3 years, I have attempted to self-film, and have also dedicated a big part of my hunting season to strictly videography. Other interests include fishing, shed hunting, mushroom hunting, and turkey hunting. I have a bachelors degree in forestry through SIUC. I thoroughly enjoy the aspect of habitat management and improvement on both my own and other pieces of property in the area. I believe that a big part of hunting is not the harvesting of animals, but fellowship, camaraderie, and tradition that preserves this sport. Born and raised in east-central Illinois. When not working for the University of Illinois he enjoys chasing public land whitetails and turkeys. He also loves shed hunting, smallmouth and crappie fishing in the off season with friends and family. Some believe he may be Amiri King's relation. Home town: Reed City, MI. Born in the Mountains of Colorado then moved to Michigan with my family when I was 10 years old. My Dad started my hunting addiction by taking me Elk and mule deer hunting. I was hooked with the first stroke of face paint he smeared on my little face. Once we moved to Michigan, I started shooting bows and when I was 12, my Dad and Grandpa took me out and I shot my first deer the first morning in the stand. To me it was the biggest most exiting thing in the world. Once I was done with high school I followed my dream and went to guide school and bought a camera and became an elk hunting guide in Colorado. After I spent a year doing that, I came back to Michigan and went to college to start my career in heating and cooling. I am married to the love of my life that puts up with my addiction 365 days a year and we have two great kids. I enjoy taking my kids out hunting and fishing to pass on the love of the outdoors as my Dad and Grandpa have taught me. I love being in front of or behind the camera; sharing the love of this sport. Hunting has been an addiction of mine since my father took me out whitetail hunting at the young age of ten. Since that first encounter, I've been hooked! Growing up on a farm and having all the opportunity in the world to enjoy the great outdoors was all I needed to get started. It was whitetail hunting at first, and pretty soon it was squirrels, turkey, pheasants, and anything to get me out hunting. Lately I've been to Wyoming, Montana, and Colorado to experience some of the best elk and mule deer hunting offered. All of these opportunities has driven me to want to sharemy experiences. That is why I started documenting my hunts by filming them. From the beginning to the end, every hunt has its own story, and I'd love to share mine with you. As early as I can remember hunting has been a part of my life. My father and grandfather always made it a point to get me into the outdoors and spend some quality time together. It began with squirrels and doves, but today my true passion is hunting giant whitetails. I am a 22 year old student at Southern Illinois University Carbondale, which makes it tough to hunt as much as I would like but I make sure to get home on the weekends to chase critters. My involvement with Team Radical has brought great people into my life and has led me on awesome adventures. I hope to share and pass on the sport of hunting for each generation to come. At age 10, my uncle brought me to a local bow shop to setup my first bow. As for other gear, I just rounded up whatever I could; an arrow here, some camouflage there. I began hunting on weekends with my older cousins who taught me the basics and I harvested my first deer at age 11 by bow. I have come a long way since then, with 19 years of whitetail experience under my belt. A majority of my knowledge and successes came due to trial and error in previous hunts. My goal as a youth to spot a deer and kill a deer has evolved over time. I am now more interested in hunting mature 5 year-old plus bucks and take more pride in watching them grow over the years and developing a history with them than killing a young deer. For the last 10-12 years, I have taken an interest in land and land management coinciding with farming and work to create food plots and sanctuaries to create a healthier deer heard. Anymore, I appreciate watching the animals enjoy the land I managed for them and grow to an older age class, just as much as I enjoy the hunt itself. My hard work and plentiful hours of land management, practicing shooting my bow, building and strategically placing deer stands/blinds, and running trail cameras has paid off. In 2007, I killed a giant 10-point typical by bow, which ranked as the biggest typical whitetail archery kill in North America that year. This hunt among others makes all of my dedication to farming and land management worth the labor. In more recent years, I have taken on a new challenge and now devote more time and effort to self-filming my hunts. I have caught multiple deer and turkey hunts on film and am learning how to take my videography to the next level by turning these clips into hunting films. I am appreciative of Team Radical for bringing me on to their team to help take my filming to the next level, while also allowing me to work side by side with men who share similar passions. I also thank my family for all of the time and help they have provided me to make all of my hunts possible and I thank my friends for the good times we’ve had together during some good hunts. Growing up in south Mississippi, being an outdoor enthusiast wasn’t a hobby, it was always a way of life. 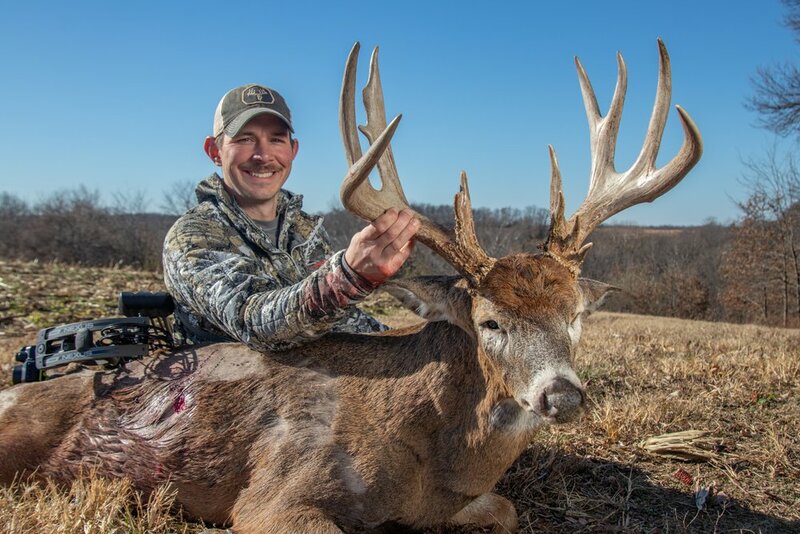 Fishing and turkey hunting have always been a passion of mine but managing for whitetail deer has always been the ultimate goal with the hopeful privilege to harvest mature whitetails. Although being new to the state of Illinois, I’m not new to the hard work and dedication it takes to produce the best deer possible. I’m thrilled to join a group of men with the same passion and commitment, and look forward to sharing the memories on camera! I began my filming as early as the age of 12 or 13 years old, back when video cameras still recorded to VHS tapes! My brother and I could not hunt with guns alone at that time so he and I would go hunt with our camera. I remember calling in several turkeys just to video them, thats where my love for videoing wildlife began! Since then I have filmed just mainly for memory sake and to show my memories to others. This team will give me even more of an opportunity to share my stories and memories with other people that share the same passion for hunting and filming as I do! Im excited to bring you guys my experiences through my camera lens. I love hunting mature whitetails and bringing stories of certain deer to life. They are magestic magnificent animals and I cherish every moment that gives me the opportunity to build their life story! Turkey hunting is also a very big passion of mine and I hope to bring some incredible turkey footage to all of you! I’ve hunted turkeys all over the western and midwestern states, hopefully I can continue my success and bring all of it to the viewers of Team Radical! God bless everyone! From the time I was old enough to climb down out of my dads truck and follow him to the woods, with my cool orange vest and hat, I was hooked. My love for the great outdoors started early and has remained my biggest passion in life. Over time it has evolved from just hunting, to the year round experience the midwest has to offer. Chasing mature trophy whitetails and fooling the elusive long-beard is only a part of what I love to do. The overall management of the herd and the habitat that they live in is what keeps me walking back into those same woods from my childhood, with the same excitement as that first day I followed dad into them. Theres nothing more satisfying than watching these animals mature and reach their full potential. Adding the filming aspect to this entire experience not only allows me to relive these moments, but also allows me to share all of the amazing things an outdoorsman gets to witness and be apart of, every time we leave everything else behind and head to the woods. Thanks to my father, I started hunting the whitetail woods at the age of 10. Although the hunt is and never has been about the kill, the true adrenaline never really hit me until I harvested my first deer 3 years later. From that moment, I was hooked. Later in my hunting career, a good buddy of mine, Phil Ruholl, introduced me to what was soon to become my true passion, the spring turkey hunt. Around the same time, Phil and I bought a camera together and started filming hunts to capture every experience we encounter. The beginning of Team Radical was soon to follow. Hunting is more than just a hobby for me, it's also critical for my livelihood. Along with my brother, I run a small-town archery retail storein the middle of south-central Illinois' whitetail hunting paradise. I also own a trucking company that is contracted with FedEx Ground. Both of these keep me pretty busy, but when hunting season is in, I sneak away as much as I can. I mainly hunt whitetail and turkey in Illinois, but any time I get an opportunity to hunt somewhere different, I take it. What I love most about hunting is that each time it's a different experience. Although I love to take the game myself, I'm just as happy behind the camera. Either way, I do think I look pretty cool with face paint on. All kidding aside, please hunt safe and encourage younger generations to get outside and enjoy this blessed land God has provided for us.